Der Artikel Enrico Rava (geb. 1939): Easy Living wurde in den Warenkorb gelegt. + Gianluca Petrella, Stefano Bollani u.a. “Contemporary Italian jazz can be said to have begun with Enrico Rava”, writer Mike Zwerin observed last year in the International Herald Tribune. And now the history-making trumpeter returns to ECM, with his first album for the label since 1986’s “Volver”. Featuring his regular Italian quintet and recorded in Udine, “Easy Living” finds Enrico Rava, in his 65th year, playing with unforced inspiration. Working ‘in the tradition’, he is characteristically disinclined to be limited by it. The informed ear will catch fleeting references to Rava’s wide-ranging past, which has embraced all stations from Dixieland to film music via free jazz, yet the mood of the album as a whole is unified, low-key but focussed, and Rava’s trumpet sings, perhaps more eloquently than ever. “I’m extremely happy about this record”, Rava told American magazine All About Jazz. “I think it’s by far the best record I ever made. Everybody on the record sounds beautiful. The session was so easy, so relaxed… Everybody was very much into the music.” Producer Manfred Eicher also stressed that the recording felt like a very natural continuation of the ECM collaborations with Enrico of the 1970s and 1980s, as if there had been no 17-year hiatus. In general, the disc bears out the judgement of the Jazzpar Prize jury who elected Rava musician of the year in 2002. “Rava has proven himself adept at many styles… His bittersweet music does not fit neatly into any one genre. He can play fiery and lyrical lines and he can generate romantic atmospheres. 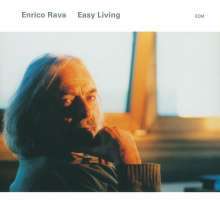 Enrico Rava may shift between abstraction and structure but he mostly plays the trumpet with a warm, mellow sound – smooth and intoxicating. Sometimes his slow, spiralling, bop-like lines glide into free terrain. His phrases often close with a slur and he may employ half valves and other means to obtain a lyrical and adventuresome voice.” He may indeed, and on “Easy Living”, that lyricism is much in evidence. Apart from the venerable jazz standard that gives the album its title, Rava’s new disc is comprised of original compositions, including a new look at “Blancasow” the yearning ballad that originally concluded his ECM debut album, “The Pilgrim And The Stars” back in 1975. Rava (born Trieste 1939) made history as the first of the Italian jazz musicians to find acceptance from the international improvising community. After a brief period as a teenaged New Orleans style trombonist, he switched to trumpet after seeing Miles Davis in Torino. He played first with Gato Barbieri, then, in rapid succession, with Mal Waldron, Steve Lacy (including the epochal ESP recording “The Forest and the Zoo”), Carla Bley (“Escalator Over The Hill”, and European tours), Lee Konitz, Cecil Taylor, Don Cherry, Charlie Haden, Archie Shepp, many others. Living in New York in the late 1960s he was for four years a member of Roswell Rudd’s group), and both trumpeter and trombonist played extensively with the pool of musicians in and around the Jazz Composer’s Orchestra. Rudd’s association, furthermore, with trailblazing ethnomusicologist Alan Lomax, opened Rava’s ears to the music of the whole world. Enrico’s first New York group as a leader included John Abercrombie, and the association continued for some years after the trumpeter’s return to Italy – the quartet on Rava’s first ECM recordings featured also bassist Palle Danielsson and drummer Jon Christensen (“The Pilgrim and the Stars”, “The Plot”). ECM also issued Rava’s New York- and Buenos Aires-recorded “Quotation Marks” whose sprawling line-up included John Abercrombie, Jack DeJohnette, singer Jeanne Lee and many others, and recorded him, additionally, with Alex Schlippenbach’s Globe Unity Orchestra (“Compositions”). By 1978, Roswell Rudd was also on board, rejoining his old comrade in a widely respected quartet that included the resourceful rhythm section team of Jean-François Jenny-Clark and Aldo Romano. Other ECM discs under Rava’s leadership introduced significant Italian jazz talent including pianist Franco D’Andrea (“Ah”, “Opening Night”). His “Volver” group was co-led with Dino Saluzzi. In the 1980s, Rava also had a productive collaboration with English drummer Tony Oxley, working with him in many different contexts, including a short-lived but widely acclaimed project with Miroslav Vitous and Joe Lovano. Within the last decade, Rava has achieved some popular success with a number of concept albums on other labels, including recordings based on opera themes, tributes to Chet Baker and Miles, movie music (including an album of “En Noir” duets with Ran Blake)... He also, for several seasons, joined the big band that ECM had been instrumental in bringing to wider public attention, the Italian Instabile Orchestra. Although he has since moved on again, Rava’s forceful presence with the Instabile, at international festivals, struck a responsive chord with the public and the critics. Right now, Rava seems to be at the top of his game. The quintet just returned from a successful residency at New York’s famed Blue Note club and continues to find itself much in-demand despite the various cutbacks that currently plague the touring circuit. In Italy he continues to be lionized and a Rava biography-in-interviews, “Note Necessarie”, is scheduled for March publication (by noted Italian publishing house Minimum Fax ) – concurrently with the release of “Easy Living” and a major Rome auditorium concert on March 11th. Pianist Stefano Bollani is a quick-witted player whose lyricism is sometimes tinged with irony. A professional musician since the age of 15, he’s played with everyone from Pat Metheny to Han Bennink, via Elliott Sharp, Lee Konitz and Phil Woods, and his leader dates for Label Bleu have been well-received by the press. He won the Italian Django d’Or in 2000. Bassist Rosario Bonaccorso is especially valued for his ability to play “in the tradition” and has been a valued sideman for international players including Benny Golson, James Moody, Lee Konitz, George Coleman, Clark Terry and Cedar Walton. M. Inhoffen in stereoplay 5 / 04: "Rava glänzte zwar mit diversen CDs in den letzten Jahren, doch nie zeigte er diese kontrollierte Leidenschaft, diese Feinheit des Aus- drucks und emotionale Tiefe wie auf der vorliegenden Ein- spielung. An seiner Seite weiß der Schnauzbart aus Trier ein brillantes Quartett, in dem neben Posaunist Gianluca Petrella und Kontrabassist Rosario Bonaccorso zwei Musiker besondere Akzente setzen: Roberto Gatto mit seinem ori- ginellen Schlagzeugspiel und der vor Ideen sprühende junge Temperamentbolzen Stefano Bollani am Piano. In diesem Rahmen blüht Enrico Rava hörbar auf, und seine strahlende Trompete leuchtet die wunderbare Welt des mo- dernen Jazz in all ihrer schillernden Vielfalt aus." R. Köchl in Jazz thing 4-5 / 04: "Nie zuvor nämlich, weder bei ECM noch bei einem anderen Label, wurde Enrico Ravas stilistischer Genius offenkundiger. Der Mann ist ein Musiker, der in einem Ton schlicht alle Stile vereint: Bop, Free, Canzone, Film Noir. Ein lyrischer Abenteurer, der einzige, der wirklich authentische Geschichten er- zählt."